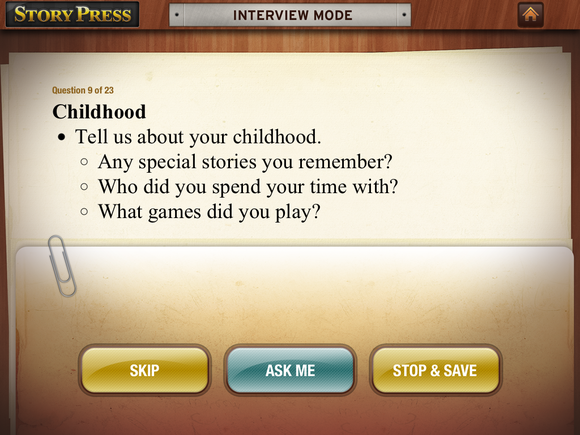 If you’ve ever had a hankerin’ to sit down and craft your own biography—or to collect the stories of your parents or grandparents before they pass on—StoryPress, a free iPad app from GhostGear Labs, is just the place to start. It helps you record oral histories that sound nearly as polished and professional as the Story Corps pieces you sometimes hear on NPR. After you log in with an email address or your Facebook account, StoryPress wants you to jump right into the creative process. You’ll enter your name, the year of your birth, and then create a cover for your first book. (Despite the conceit that you’re creating a book in StoryPress, there’s very little text involved: You’ll be recording your memories, not typing them out.) The cover includes the title, an icon from a list provided by StoryPress, and a photo from your iPad library. Your next prompt is to select a method to record your tale. Select “Dictation” if you already know precisely the story you want to tell—just tap a button in the app and start recording while you talk. Most of us, though, will want to use the second option—“Interview Me”—which gives you a choice of more than a dozen categories, each featuring an interview template of roughly a dozen questions or more. Don't know where to start with your bio? StoryPress will interview you. I chose the “Childhood” category, which offered nearly two-dozen questions. The questions—and, often, a few secondary questions—appear on the screen. You push a button to begin recording and answer the question, or can skip the question entirely if you don’t like. Depending on how much of a storyteller you are, this can be an arduous process: Luckily, there’s an option to pause the questioning and come back later, which is particularly useful if you want to get down into detail. 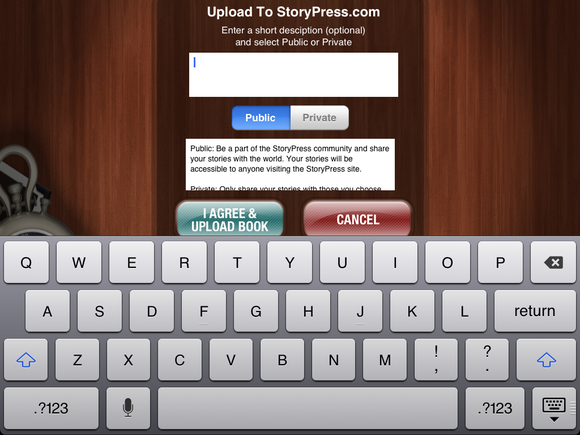 Once done, you’ll upload the finished book to StoryPress.com, choosing to do so either in private or public mode. Both modes let you share your story with friends and family via Twitter, Facebook, or email—friends are directed to StoryPress’s website to listen. If you save a story publically, it becomes part of StoryPress’s social network of folks who trade stories about the good old days. Both public and private modes let you share your story with friends, but public makes it available to the StoryPress community. 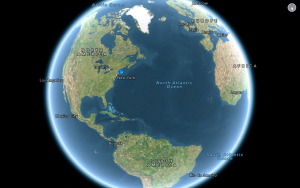 This is a good app. It is easy to use, and has crystal clear recording—but there are some items on my wish list for future editions of StoryPress. Oral histories can be rich, but it would nicer if there were more visual elements at play: The ability to add more photos of an event being described, at the very least, or perhaps the ability record video interviews. 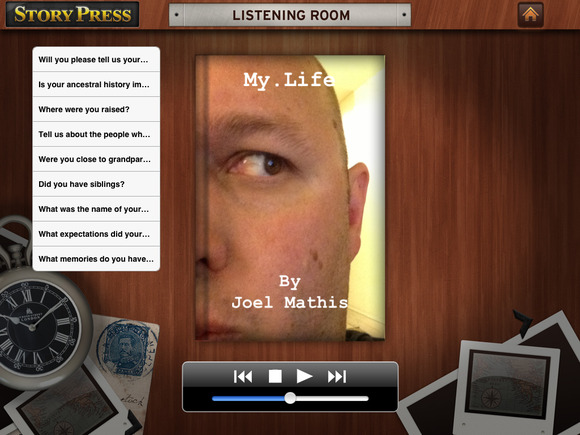 StoryPress is a fun, easy way to start telling and collecting the real-life stories that mean the most to you.